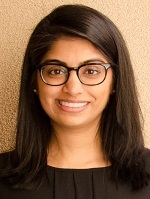 As an attorney in the Impact Litigation Practice, Niji Jain develops and litigates civil rights and class action lawsuits to reform the systemic and structural inequities affecting clients of The Bronx Defenders. Prior to joining The Bronx Defenders, Niji worked on complex federal litigation at Patterson Belknap Webb & Tyler LLP and clerked in the U.S. District Court for the Northern District of Georgia. During law school, she was a student attorney in the Juvenile Defender Clinic; interned with the Southern Center for Human Rights, the Equal Employment Opportunity Commission, and the Atlanta Volunteer Lawyers Foundation; and served as Vice President of the Public Interest Committee. Niji graduated Order of the Coif from Emory University School of Law, where she was a Robert W. Woodruff Fellow, and received a B.A. in Human Biology from Stanford University.